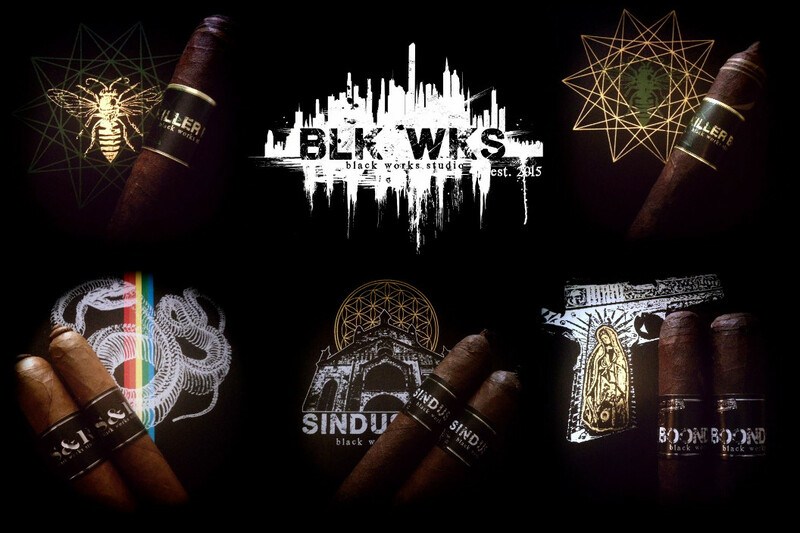 July 22, 2016 — Black Works Studio (BLK WKS) is announcing the addition of S&R, Boondock Saint, and Sindustry to its lineup, as well as additional vitolas for NBK and Killer Bee. “As a cigar maker and artist, I am always working on new blends and expressions of art. These new blends have been in the works for a while, and I did not want to miss the opportunity to release them to the public. I will find ways to continue to be creative in my craft going forward and won’t be deterred by the FDA regulations,” said James Brown, creator of BLK WKS and partner at Fabrica Oveja Negra. “Each of these new blends is very unique. S&R is an elegant smoke with refined flavors, highlighting the blend of Dominican and Nicaraguan tobaccos. Boondock Saint’s complex rich flavor comes from the blend of three very diverse filler tobaccos and the Pennsylvania wrapper. Sindustry is the boldest of the bunch with full flavors and strength rounded out by the San Andres wrapper,” continued Brown. · S&R – features Nicaraguan & Dominican filler with a Sumatran wrapper and pigtail cap. Available in a 6.75x42 Lancero, MSRP $8.50 and a 5.5x46 Corona Gorda, MSRP $8.00. · Boondock Saint – features Nicaraguan, Pennsylvania & Connecticut filler with a Pennsylvania Broadleaf wrapper and closed foot. Available in a 6.25x46 Corona Larga, MSRP $10.00 and a 5.25x50 Robusto, MSRP $10.00. · Sindustry – features Nicaraguan filler with a San Andrés wrapper and closed foot. Available in a 5x50 Robusto, MSRP $9.50, a 6.25x48 Toro, MSRP $9.50 and a 7x38 Lancero, MSRP $9.50. NBK is now available in a 5x50 Box Press Robusto, MSRP $9.00. Killer Bee is available in a 6.5x42 Lonsdale, MSRP $8.50 and a 4.5x46 Petite Corona (Green Hornet “Kato”), featuring a Candela linear cap, MSRP $9.50. Tobacco Junction, Temple TX; TJ’s Cigar Lounge, McGregor, TX; Crescent City, New Orleans, LA; and Harry’s Smoke Shop, Philadelphia, PA.
BLK WKS cigars are an expression of art showcasing the talent, technique, and tobacco behind boutique cigar factory, Fabrica Oveja Negra. Distributed by Boutiques Unified, www.BoutiquesUnified.com.